Fig. 1. Trigrams arrangement: Eight trigrams in serial order, starting with Li to the right (East). Fig. 2. The yearly cycle with four trigrams inserted. Winter: from middle Tui to middle Li. Fig. 3. The yearly cycle with eight trigrams into it. This is the King Kong Serialisation. The trigrams of the I Ching have been arranged to get aligned astrology thinking of India and the West. The foremost means is the compass directions. Trigrams are lined up to them in a sensible way, which often harmonises with Chinese astrology too. Some of these metaphoric correlations are in common use, as you can see. And as the year goes through its seasons, life has its correspondences to that, too. Correspondences can be put into a map or survey, as has been done here. Through the King Kong serialisation of trigrams we reach a stunning cosmology. In it, some of the traditional animals (etc.) that are associated with each trigram, are accompanied by som new ones. The old and new trigram animals do not contradict one another, but speak of different sides to the trigram. If you do not like "Eagle", you can try the traditional "horse", for example. They both represent to "north-east" in any case, and that is where the star sign Scorpio is. The sign of Scorpio has been assigned two symbols in history - the Scorpion and the Eagle. The latter, a symbol of power and might, may soar high up into the heavens and stoop down quickly too. COMPASS DIRECTIONS AND ANCIENT CHINESE TERMS: If you read the figure like a map, the first, eastern "piece of the cake" is called Li, the second, south-eastern is Kun, the third in the south is Kan and so on. This novel alignment aligns I Ching thought to the astrology of India and the West, and suggest natural harmony through its serialisation. LESSONS OF ANIMALS: There are animals to associate with each compass direction here as is fit. What is more, each direction can be associated with an animal, and maybe two and three. There is a way to bring about that line of associative wisdom: A new year begins in spring when the sap comes alive, and a baby normally comes out when it time is ripe too. The pheasant may start to work on the farm more directly as the winter subsides, the baboon represents human id, as the baby could do too. Here is an idea behind essential symbols of the I Ching and Chinese, Indian and Western (Babylonian) astrology: Certain animals show predominant characteristics to link (associate) with such yearly seasons and their fulfilments and attunments; with certain idealised day-and-night correspondences; and many more cardinal phenomena. Here we suggest that it is possible if you sift hallmarks of activities, of bodily shapes and organisation among the animals themselves and structure them too. By focusing on main features of spring, summer and further, we get hints at unfoldments fit for each period.. So selected animals can be made use of to illustrate functions (doings) and outlets found in mankind too - some activities are surely more called for in Spring than in Winter, to put it bluntly. We are to understand these key elements figuratively, as speaking to human functions and trends; that is the basic idea. ID-ALIGNMENT AT THE BOTTOM OF IT: Here is a systemic outlook relating to how nature operates on a large scale and sensible alignments to it. We have to look into such matters very carefully to get handy wisdom out of it. The associated animals can be used to aid memorisation of the separate I Ching trigrams. Animalistic symbols don't try to contradict or offend one another. Instead they are used to focus on human id functions. Therefore, you can use any animal that you like, if it is fixed to the systemic arrangement in a musty and sensible way. That is up to you. THIS IS AN ALL-ROUND SYSTEM: Here is an all-round arrangment that aligns I Ching to natural occurrences and astrology. How sensible it is, is to be tried out. 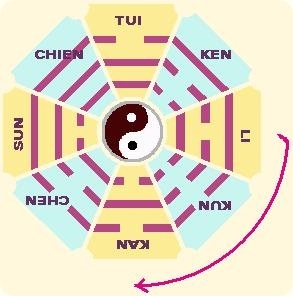 The placement of the trigrams Kun (earth), Chien (heaven) and Ken (still) are as in the old King Wen's arrangement. The rest are reshuffled to tie in with the natural yearly cyclus (on the Northern hemisphere) as far as possible. What is the difference between King Kong's arrangement and that of King Wen and that of Fu Shi before King Wen again? The King Kong serialiation is designed to augment many good things in life. The hallmark of good adjustment is deep satisfaction in the long run. Also, the superior man exhorts people to help one another. Even birds need to adjust to one another on the same limb, in the neighbourhood and further. The hallmark of good adjustment is deep satisfaction in the long run. The novel King Kong arrangement of the 64 hexagram aligns them to Tarot and Indian astrology's teachings of dwadashamsas and the traditional way of spreading them out over the zodiak. through such a "natural correspondence" King Kong's hexagram arrangement aspires to foster and further gread id, or King Kong - that is, libido, zest, vivacity and other life force outlets. The underlying idea of the King Kong array is to help natural libido on and up to last for a quite long time too, for example dozens of years. Id has to do with irreverence. Id is needed for health, through psychosomatic or somatopsychic infiltration - you may have to think about it. King Kong matters won't lessen you and your laughs, nor your possible and neglected talents. The systematic arrangement gives many good hints for favourable outlets, all in all. They have to be generalised. That's how it works. Some may prefer the old King Wen's way of arranging the items, and there is room for that table of hexagrams too (see the tables on the previous page). You get it both ways. The main idea of the King Kong is assisted solvency through neat alignments (a) with natural cycles, and (b) other, somehow similar structural thought-systems like astrology. I Ching consists of sixty-four hexagrams. You can see a hexagram here (hexa = six). All hexagram liness are built up from bottom and considered that way as well. A hexagram has a nether part, a set of three lines that is called a trigram (tri, three). There is is also an upper set of three lines, one more trigram. There are eight different upper trigrams and eight different lower trigrams and when they are combined in all possible ways, we end up with 64 combinations, that is, 64 hexagrams. In other words, we arrive at the sixty-four different hexagrams if we cross the eight upper and eight lower trigrams. In the illustration, the upper trigram is called Kan (abyss etc), the lower trigram is called Chien (heaven etc). They make up the hexagram called "Nourishment" and more. To repeat, a hexagram consists of six lines on top of each other. They make up a set of two trigrams. There is a total of sixty-four combinations, that is, sixty-four hexagrams. Different spellings of the hexagram names and trigrams names are found. The six lines are numbered and read from the bottom up: It reflects how they are fabricated. One of the hexagrams is called Chien Sun in Chinese. It means the trigram Sun (Wind etc.) is at the bottom, and the trigram Chien (Heaven, Creativity, Power) is on top of it. The interpretation derives from how the lines combine on their way up. Chien Sun (the trigram Chien on top of the trigram Sun), also has the allotted number 44 and summary captions like "Encroachment" traditionally. The lower trigram is like a growing body, if all goes well. The upper trigram can be likened to the head and face. The serial order of ancient hexagrams that is introduced in Table 2 (previous page), is a way of "stacking" and portioning out the items (hexagrams) to match how the traditional arrangement of dwadashamshas is in Indian astrology. It is the King Kong serial arrangement of hexagrams, and differs in some ways from King Wen's arrangement. There are some other ways of arranging the hexagrams too. They are not shown here. The hexagrams in their traditional Chinese order (King Wen's arrangement) are in the first table on the previous page. Listen to your heart and master your fate. The hexagram of the example is called Chien Sun, (which gives "Kou" too). The hexagram carries titles like "Encroachment" - and there are helpful, nice drawings to illustrate core meanings to some, and captions like "You can listen to your heart and yet remain the master of your fate." It is possible to form several sophisticated and easy maxims to go along with each hexagram. Some come as commentaries. EACH compass direction is associated with an animal, maybe two and three of them too, to suggest some cardinal, natural correspondences. The associated animals may help recall of the separate map directions. You may come across different animals allotted to each trigram too. The animals put in boldface in the text, are the traditional ones. GRACEFUL. Brilliant. Pheasant. Elegant. Intelligent. Eye, what meets the eye. Dependent and conform too. Lightning. Lightning wisdom. Peculiar nonsense as humour outlet. DEVOTED. Remarkable. Heart. Mare, cow. Completing things. Solidly patient. Something hidden. Mom. Dark (as hearts). Might. Submissive. Warm or moist. A lap (mom's lap, that is). Remarkably witty too. DANGEROUS, ABYSMAL. Deep, too deep at times. Abyss. Boar. Waters. Cloudy. "Moonish". GENTLE AND MELLOW. Wind. Flexible. Something gradual. Wood. Chicken. Blithe and mirthful. Penetrative. Penetrative wisdom. Cool slapsticks. ACTIVE. Strong-willed. Visible. Lean. Heaven. Horse. Creative energy. Bright. Firm. Mind's "ice" (can be ideas and so on). SOLID AND STANDING STILL. Placid. Resting. Stubborn at times. Quite thoughtless. In need of deep-going education, probably. Turgid (pompous-sounding) at times. Hills. Wit. Mountains. Youngest dog. In need of contact too.